Eternity: How To See Forever On Your Dirty Car : 13.7: Cosmos And Culture Carl Sagan, an astronomer with the soul of a poet, liked to remind us that we were all made of "star stuff." It was, without a doubt, one of his most beautiful images. Astrophysicist Adam Frank says it's not just an abstract concept; you can reach out and feel it in the space dirt covering your ride. Your direct connection with the stars and all of the space in between them. Carl Sagan, an astronomer with the soul of a poet, liked to remind us that we were all "star stuff." It was, without a doubt, one of his most beautiful images. But what, really, was Sagan talking about? Well, there are two answers to this question. The first is remarkable, the second is crazy-remarkable and, if we pay attention, both can open a hidden doorway for us to the depths of time we swim in everyday without ever noticing. Let's unpack the remarkable answer first. Every atom in your body was produced in space eons ago. The simplest kinds of atoms, such as hydrogen, date back to the Big Bang some 13.7 billion years ago. Everything else (carbon, oxygen, iron, etc.) was born in the furnace of a star once stars started forming, about a billion years after the Big Bang. What Carl Sagan was telling us is that stars aren't just out there in space. The stuff of stars, their elements, make up your body, your food, the car you drive. They are all right here on Earth right now. But now comes an even-crazier concept, one that links the Earth directly to the heavens. How did all of that star-stuff get here? And by here I mean right here, the very Earth we stand on? The answer, my friends is dirt. Space dirt. Five billion years ago the solar system was nothing more than a vast disk of gas and dust swirling around the newly born sun. The gas was just a bunch of free-floating atoms but the dust ... ahh ... the dust was already something more. These tiny flecks of solid matter, these lowly grains of mineral, of space dirt, they were the key to assembling the planets. It started with tiny collisions, two grains sticking together to make a bigger grain. Eventually the bigger grains collided and stuck together to make pebbles. Then the pebbles collided to make rocks and rocks collided to make boulders and boulders collided to make mountain-sized asteroids and so on. Eventually we ended up with the beautiful blue-green world you're sitting on right now. Pick up a clod of earth and you are, without a doubt, cupping a handful of space dirt that once floated free in the inky darkness billions of years ago. Unless, of course, some of it arrived last year! Space dirt is still arriving and if this seems too crazy to believe, just look at that dirty car you're driving around. Each day as much as several hundred tons of material hits the Earth. The yearly figure could be as high as 100,000 tons. It could be more. To put it in perspective, that's something like a Nimitz-class aircraft carrier dropping from the sky every year. It doesn't all come at once, of course. Most of it arrives in the form of interplanetary dust caught by Earth's gravitational pull. But on any given night you might also see the bigger stuff, sand-grain-sized and pebble-sized bits of the solar system, flaring across our sky as meteors. After their fiery journey through the atmosphere, most of that material ends up as dust on the ground, too. If you do the math (and I just did), 100 tons of inbound space stuff translates into about 10,000 grains of dust added to your car every day. 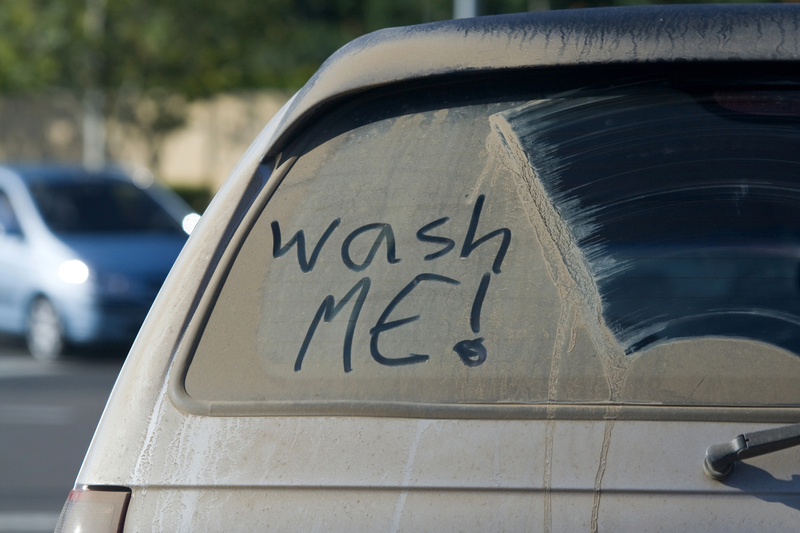 And if, like me, you make it to the car wash only once a year, then the odds are good that writing "Clean Me" on your car's rear window will leave at least a few tiny bits of dusty space dirt on your fingers. It's right there, on your fingertips, that you can meet the eternity of the cosmos up close.